On January 7, 2019, USPTO (The United States Patent & Trademark Office) published its revised set of guidance to provide clarity on subject matter eligibility criteria (35 U.S.C 101) for patentable inventions and sought public suggestions for the same. These revised set of procedures put forward the USPTO’s interpretation of 35 U.S.C. 101 by consolidating several judgments given by the Supreme Court and the Federal Circuit in several patent cases pertaining to subject matter eligibility and judicial exceptions, thereby eliminating grounds for confusion and providing an efficient and streamlined procedure that the PTO examiners can apply with significant certainty and predictability when scrutinizing patent applications. Before we move onto the changes and steps introduced in the procedure applied during patent application examination, it is required to apprehend the existing guidelines which in itself was a result of cumulative amendments. In the existing model for ascertaining patentability under 35 U.S.C. 101, Examiner has to judge whether the invention can be grouped into the four statutory categories of invention, viz. process, the machine, manufacture, or combination of matter and improvements thereof; and does not belong to the judicial exceptions, which are laws of nature, natural phenomena and abstract ideas. To ascertain this, they apply a test, which is also known as Alice/Mayo test, which simplifies the entire subject matter requisite into two steps. In the first step, the Examiner checks if a claim of the invention belongs to one or more of the required statutory categories failing which the claim is rejected. If the claim satisfies the eligibility criteria at Step 1, then Step 2 is initiated which is again a two-fold analysis. This is done to ensure that a claim is not “directed to” monopolies the judicial exception (Step 2A). However, if the claim, and the invention as a whole, has additional elements which add a meaningful limitation to these judicial exceptions in a practical application then the invention meets the eligibility requirements (Step 2B). However simplified, these guidelines have created room for ambiguity in understanding what can be considered judicial exceptions are given the fact that post-Alice/Mayo case there have been multiple patent cases where the judgment was given, regarding 35 U.S.C. 101, were inconsistent and strikingly contrasting thereby making it difficult to apply a single standard judicial precedent in every context with utmost certainty and predictability. Additionally, in the current set-up, the Examiner has to refer to “Eligibility Quick Reference Sheet Identifying Abstract Ideas.” as its one-point reference to identify judicial exceptions. Thus, this rule of elimination/identification of an eligible claim by comparing the current set of claims with a previous set of claims which by law has already been identified as an abstract/non-abstract idea is time-taking, imperfect and error-prone process. Thus, USPTO has rightly taken a step forward to address such shortcomings and to create an effective modus operandi for better patent examination. Besides, 2019 Revised Patent Subject Matter Eligibility Guidance also helps in better understanding of 35 U.S.C. 101. 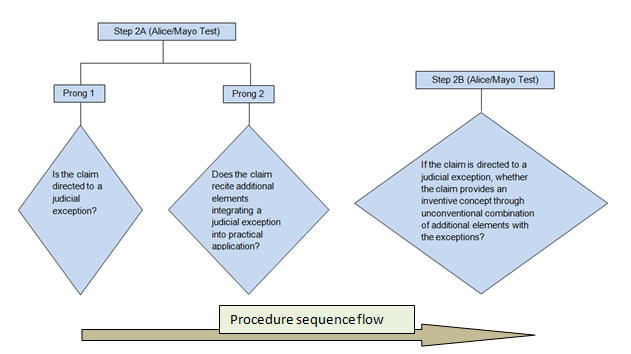 The proposed guidelines are focused primarily on the Step 2A and 2B of the Alice/Mayo test and elucidates the subject matter that can be considered as an abstract idea by broadly grouping them into three categories; and further clarifying that a claim, in light with the complete invention, is not “directed to” a judicial exception if the claim teaches additional elements which integrates a judicial exception into a practical application (Prong 1 & 2 of Step 2A). Besides, for any invention “directed to” judicial exceptions may still be patent eligible provided there are additional element(s), each examined independently in combination with the exception, the use of which in relation with the judicial exception is unconventional and establishes an inventive concept. 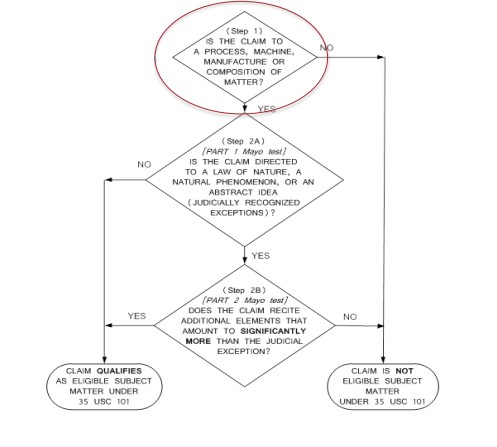 The significance of these elements to the overall invention is not held to be paramount for determining eligibility, but these elements should impose a meaningful limit on the exceptions and not just be a drafting technique to avoid objection (Step 2B). Moreover, the “Eligibility Quick Reference Sheet Identifying Abstract Ideas” is now considered obsolete because of a comprehensive grouping of abstract ideas ushering in more clarity and understanding of patentable subject matters. Thus, the procedure of conducting patentable subject matter eligibility examination is now more detailed and simplified. Though this is primarily introduced for the Examiner to conduct a 35 U.S.C. 101 eligibility test with utmost certainty and predictability, but on a larger picture helps in creating a common ground of understanding for all stakeholders involved mainly, USPTO, judiciary, and the patent applicant. This is a positive step forward in establishing a complete understanding of 35 U.S.C. 101 from the perspective of USPTO and the judicial approach, thereby creating a uniform and balanced playfield for patent applications to come under scrutiny.